මේ කියන්නේ යන්නේ අපි කවුරුත් වගේ පාවිච්චි කරන google chrome browser එකත් එක්ක වැඩ කරන්න පහසු කරගන්න අලුත් විදියක්.google සමාගම දෙන සේවාවන් වලින් අපි නිතරම භාවිතා කරන සේවා වලට ඉක්මනින් යන්න පුළුවන් launcher එකක් තමයි මේ අලුත් දේ.විශේෂත්වය වෙන්නේ browser එක open නොකර අදාළ සේවා වලට යොමු වෙන්න පුළුවන් වෙන එක.මේ විදිය නිසා url ටයිප් කර කර ඉන්න ඕන නැහැ.එක click එකකින්ම වැඩේ කරගන්න පුළුවන්. 2.Free button එක click කරන්න. 3.දැන් taskbar එකට මේ වගේ අලුත් icon එකක් ඇවිත් ඇති. දැන් බලමු මේකට කොහොමද තවත් apps එකතු කරගන්නේ කියලා. 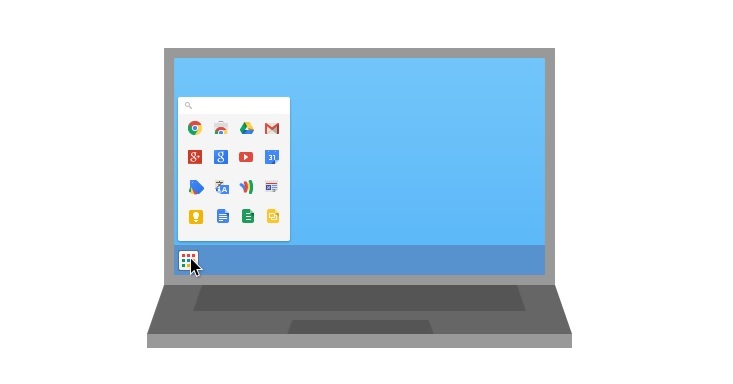 මුලින්ම app launcher එක open කරගෙන ඒකෙ තියන chrome store icon ඒක click කරලා store එකට යන්න.add කරන අලුත් apps සේරම launcher එකට auto add වෙනවා.add වුන app එකක් remove කරන්න app එක උඩ right click කරලා remove from chrome කියන එක select කරන්න ඕන. user අතර මාරු වෙන්න නම්, launcher එකේ තියන මේ icon එක click කරලා, එතනින් settings -> users -> new user -> switch user පිළිවෙලට යන්න ඕන. ඒ වගේම linux, mac, windows කියන platform 3ටම වැඩ කරනවා. This entry was posted in FOSS, Software and tagged app, chrome, google, launcher, linux, mac, software by dhanush_c. Bookmark the permalink.